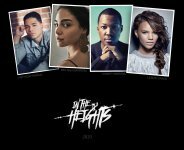 In the Heights release date is set for Friday, June 26, 2020. This will be a Nationwide in theaters release. Based on the Tony Award winning Broadway musical, created by Lin-Manuel Miranda. The film rights reverted back to Lin-Manuel Miranda and Quiara Alegría Hudes before The Weinstein Company went into bankruptcy. Disney and Warner Bros are strong candidates to grab them now (Deadline.com, 4/5/18).